Tar spots have been evident on many species of maple. The disease has been especially widespread in the northern portion of the state. Several different fungi in the genus Rhytisma cause this disease. 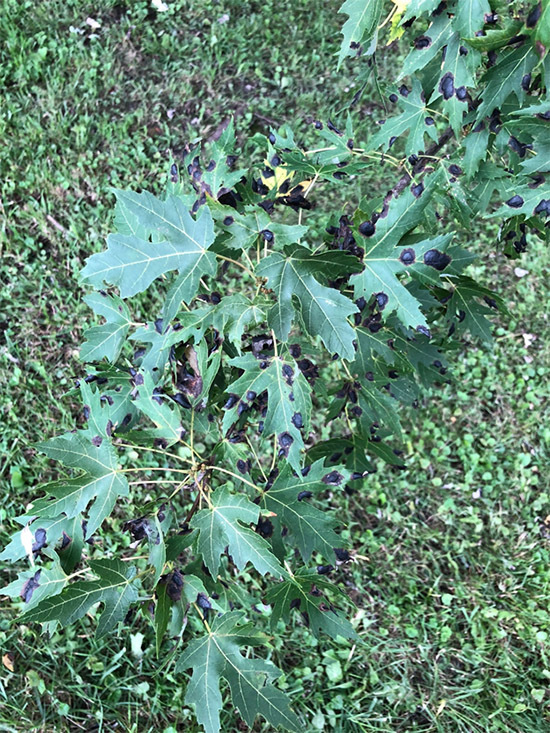 Tar spot results in raised, black spots on the upper surfaces of affected leaves. The symptoms are distinct, allowing for easy field diagnosis. The first symptoms appear in mid-June as small, pale yellow spots. By mid-July, the yellow spots expand and a thick, raised, black stromata starts to form within the spot. 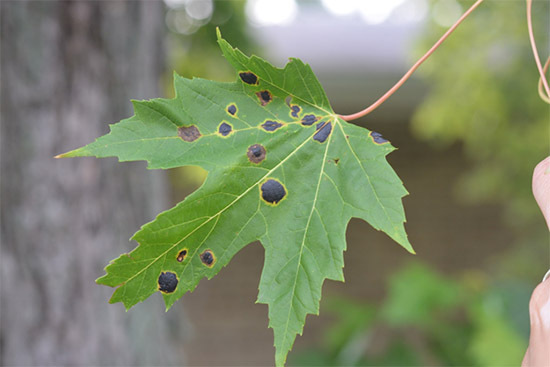 By late summer, affected leaves appear as if they splattered with black paint or tar, hence the name tar spot. When severe, the disease may cause some premature defoliation. Fortunately, the disease rarely affects an established tree's growth and development. The fungi that cause tar spots overwinter on infected leaf debris. In the spring, overwintering fungal fruiting bodies ripen and eject spores. Wind then carries the spores to nearby developing leaves of susceptible hosts where the infection occurs.